On Earth Day a few weeks ago, we participated in a clean-up challenge where we picked up as much trash as we could in an hour. 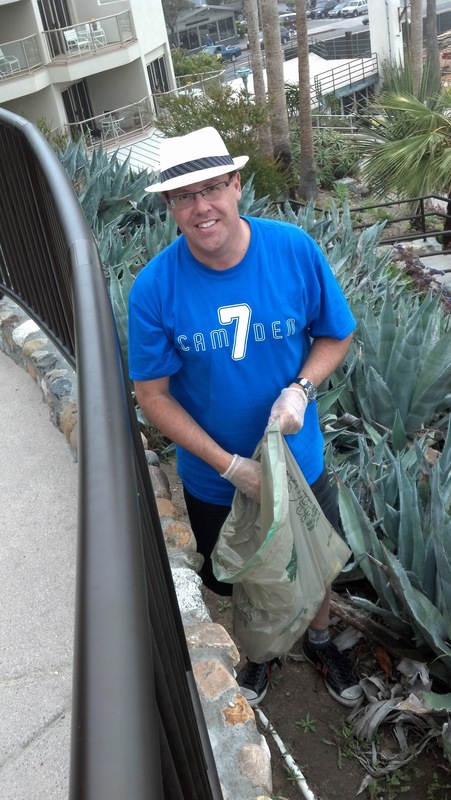 Michael and I got a real kick out of the event; we were more than happy to help make Laguna Beach as beautiful as possible since we spend so much time there. We learned that there is monthly clean up event, so I went to Target to buy our own Trash Pickup Sticks (only $10 each!) and on Saturday morning, we picked up our gloves and a plastic bag and eagerly began our hunt for trash. We jumped railings, ventured gingerly down cliffs, unabashedly (but politely) worked around tourists as we attacked wrappers, cigarette butts and plastic cups, straws and forks strewn throughout planters, around benches, and in the beautiful gardens along the walkway. By the way most people avoided eye contact with us, we realized that we probably looked like criminals doing community service. Not caring what other people think definitely paid off here. A few people made a point to stop to thank us for our work, and a few others wanted information about how to get involved themselves. This is was a great example of how you spread awareness by doing something – not just by talking about it. I talk a lot about accountability and I am a huge advocate of taking 100% ownership for your own life. But today I realized that picking up trash in a community that you live in – or cherish – is about taking ownership for your home. And that’s something that I want to do more of. I take a walk almost every day. And it kills me that I see trash littered all over my neighborhood park. Now that I finally have my own Trash Pickup Stick, I can take that with me on my walks and help clean up my own neighborhood as well. Interested in taking action? www.zerotrash.org for more information. Posted on May 7, 2012, in Life. Bookmark the permalink. Leave a comment.